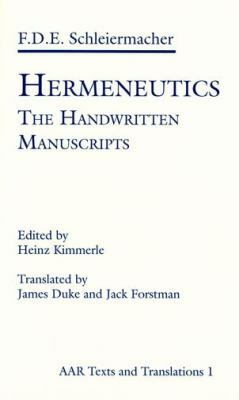 Friedrich Schleiermacher's Hermeneutics has been characterized as awatershed in the history of the field. Though he drew freely from hisEnlightenment predecessors, biblical scholars, and classical philologians,Schleiermacher attempted a full-scale reconception of hermeneutical theory.Based on Heinz Kimmerle's careful transcription of the original handwrittenmanuscripts, this volume includes a full complement of materials on hermeneuticswritten by Schleiermacher, as well as an illuminating introduction by JamesDuke.Schleiermacher, Friedrich Daniel Ernst is the author of 'Hermeneutics The Handwritten Manuscripts' with ISBN 9780891301868 and ISBN 0891301860. Loading marketplace prices 4 copies from $18.98 How does the rental process work?